Raspberry Ketone Plus is a weight loss supplement produced in the UK by Evolution Slimming Ltd.
Evolution Slimming has a good reputation for producing effective weight loss products and their customer are fiercely loyal. 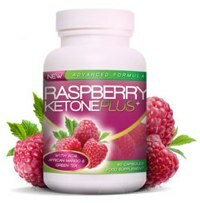 Raspberry Ketone Plus from Evolution Slimming is one, of if not the first raspberry ketone products released.Containing 200mg of raspberry ketone and also green tea and other fat burning and weight loss agents. It can also act as an antioxidant. Completely natural and backed by a money back guarantee. Raspberry Ketone Plus is both natural and powerful – if you need a fast acting fat burner, this is it folks. Raspberry Ketone Plus has been designed to assist weight loss by working as a combined appetite suppressant and fat burner. As the name suggests, raspberry ketone is the main ingredient and the recommended two capsules per day will provide 200mg of raspberry ketone. Most experts agree that this is the required daily dose for effective weight loss, so Evolution Slimming could have a winning product without the need for any additional ingredients, but the Raspberry Ketone Plus blend contains a number of inclusions that may ensure improved benefits. Green tea is an addition that compliments the formula perfectly. 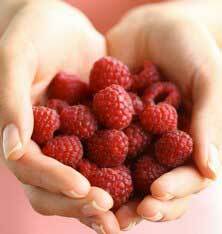 Raspberry Ketone (100mg): A natural fat burner that can be found in several fruits, including blackberries, and cranberries, but most notably in raspberries. In one study, conducted in Japan (1995), laboratory mice were fed a high fat diet, but failed to become obese because they also received daily supplements of raspberry ketone. African Mango (27.8mg): Like raspberry ketones, African mango became a hit with dieters after Dr Oz endorsed its weight loss potential. The average weight loss associated with African mango is 28 lbs. in 10 weeks. Green Tea Extract (25mg): Green tea has proven thermogenic fat burning abilities. It is also high in healthful antioxidants that can boost the overall health and wellbeing. Apple Cider Vinegar Powder (25mg): Further study is required, but early indications suggest apple cider vinegar may have the power to suppress the appetite and boost the metabolism. Kelp (25mg): Studies conducted at Newcastle University (UK) suggest kelp may have value as a fat blocker. It is also high in iodine, which is known to aid thyroid health and encourage an efficient metabolism. Caffeine (25mg): A stimulant that may also provide some degree of appetite suppression. Caffeine is known to cause side effects including jitters and headaches, but a standard cup of instant coffee contains four times as much caffeine as one Raspberry Ketone Plus capsule, so side effects are unlikely to be an issue. Grapefruit Pectin (25mg): Believed to assist weight loss by providing appetite suppression. Resveratrol (10mg): A grape extract that is commonly used to encourage fat burning, but further study is required. Acai Berry Extract (10mg): Believed to be one of the healthiest fruits in the world, acai has also acquired a reputation as both an appetite suppressant and a fat burner. One capsule should be taken 10 to 30 minutes prior to eating breakfast. A second capsule should be taken 10 to 30 minutes before lunch. 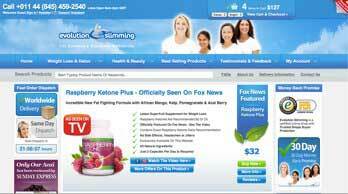 Evolution Slimming are quick to point out the Raspberry Ketone Plus was featured on Fox News – the media expose that propelled raspberry ketone as n ingredient to the forefront of the industry. Shortly after Dr Oz went on air and endorsed Raspberry Ketones as a weight loss ingredient, dieters in the US stormed the local malls etc. and bought up every raspberry ketone product on the shelves. The Fox News story focused on the resultant shortage of raspberry ketone products as a whole, and a picture of Raspberry Ketone Plus was shown for illustrative purposes. Fox News was not endorsing the product. It’s a little disappointing to see a reputable supplier like Evolution Slimming using a somewhat misleading marketing tactic such as this, but we won’t hold it against them because customer feedback suggests Raspberry Ketone Plus capsules are up to the company’s usual high standard. There are a few nay-sayers who state Raspberry Ketone Plus did not work for them and say the capsules are a “waste of money”, but legions of satisfied customers leap to the product’s defence and point out the capsules should be used as part of an overall weight management routine. Side effects are unlikely, but pregnant or nursing mothers should never use any form of dietary supplement unless its use has been sanctioned by their doctor. Anyone who has any existing health issues or concerns should also consult their doctor before deciding to use this or any other dieting product. Raspberry Ketone Plus is a recommended weight loss product. The blend provides an amount of raspberry ketone that is known to be effective for weight loss and most of the other ingredients also have a good reputation as weight loss providers. Customer feedback is predominantly good, product pricing is reasonable, and Evolution Slimming even provides a money back guarantee. Definitely one of the better weight loss products on the market. Raspberry Ketone Plus can be purchased via Amazon and eBay, but it is probably easiest to purchase directly from the Evolution Slimming online store. A bottle of 60 capsules has an RRP of £39.95, but Evolution Slimming often offer customers enticing discounts and at the time of this review they had slashed the price by £20.